The ceremony, hosted each year at Greenlawn Memorial Park, honors both those who have served and those who continue to serve in the U.S. Armed Forces. 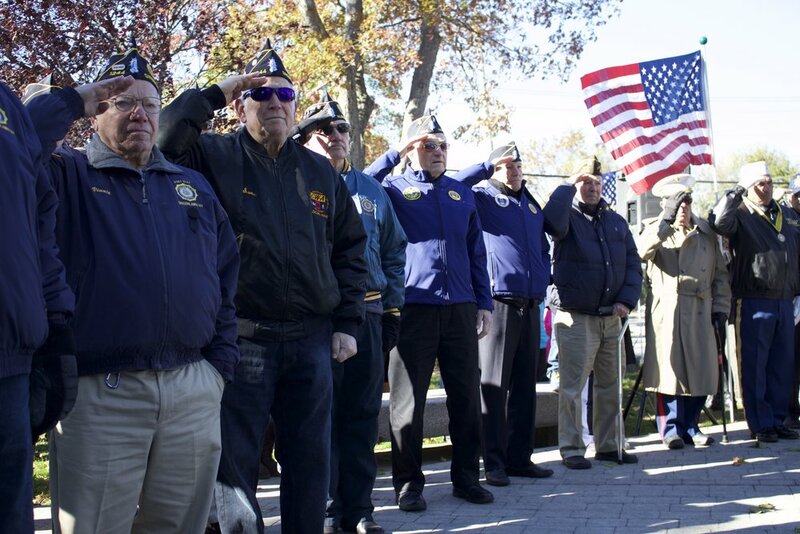 Community members joined veterans of Post 1244, American Legion Northport Post 694, American Legion Huntington Post 360, Veterans of Foreign Wars Post 1469 Nathan Hale Post in Huntington Station, Veterans of Foreign Wars Post 9263 Elwood Commack, and members of the Marine Corps League. In his speech, Post 12144 Commander Dennis Madden quoted Winston Churchill: “Never in the field of human conflict was so much owed by so many to so few.” Madden said these words had a profound impact on him. Madden continued to reflect on the sacrifices that have been made from veterans, those currently serving today, and the families who lost loved ones. He urged the community not to forget those sacrifices and the status of our country today. With that, Madden added that it’s important to remember those who have given so much of their better times, not only on Veterans Day, but every day. The ceremony concluded with the presentation of the wreaths in memory of the men and women from all conflicts who have lost their lives. The wreaths were saluted by veterans as they were placed on the monument by members of Post 1244, Greenlawn Post 1244 Ladies Auxiliary, Veterans of Foreign Wars Post 9263 Elwood Commack, Greenlawn Civic Association, Greenlawn Fire Department, Greenlawn Lions Club, Girls Scout Troop 286, and Girl Scout Troop 2150.